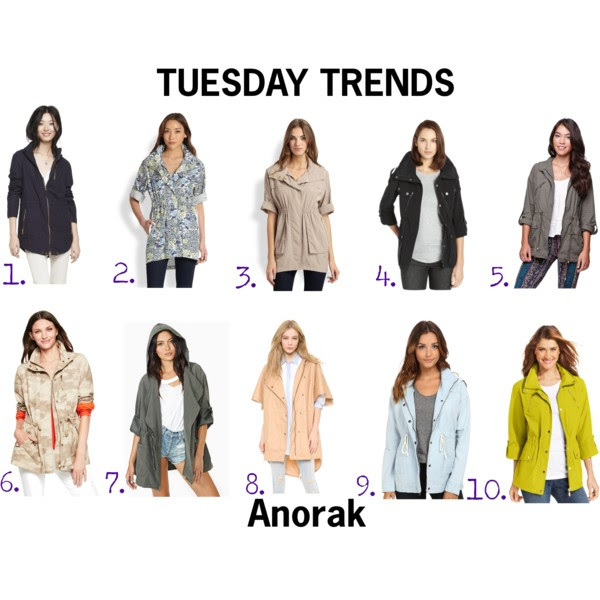 With the chillier weather rapidly approaching, my go to layering piece is my anorak jacket. I actually got a blue camouflage one back in June when I was in New York. I knew that it’d be a staple piece for fall and I couldn’t beat the $50 price tag (it’ll be making it’s debut soon). Most anorak jackets are lightweight and have a hood as a bonus. They’re perfect for those crisp fall days and have enough room for all your other layers. 1. Express / 2. Ali Ro / 3. Ali Ro / 4. BCBGMaxAzria / 5. Pacific Sunwear / 6. C. Wonder / 7. Nasty Gal / 8. Tibi / 9. Jack by BB Dakota / 10. Style & Co.